Our Route, Trip Log, Notes, and GPS Tracks: Our complete maps and notes are now up..
Maps: We carried the ITMB Ecuador Map. Although I hate the ITMB maps, this one worked. In addition, we bought the excellent book of strip maps published by the Instituto Geografico Militar, which is available in good bookstores in Ecuador, like Libri Mundi in Gringolandia in Quito and at other sites. There is also a general tourist map available in tourist offices. Its biggest benefit is the extensive charge of distances between cities. GPS Maps: We were unable to find any GPS maps at that time to download into our Garmin GPS, but since GPSTravelMaps.com has come into existence. If you know of others, please send us a note or leave a comment here. We came in from the north, at Tulcan, which is where most cyclists coming from the north would get to. By the time we got to Ibarra, the traffic started to get irritating on the Pan-Am. Approaching Quito, we kept on the Pan-Am. There's a turn where most of the traffic goes the more direct route (not on the official Pan-am) via Tabacundo. 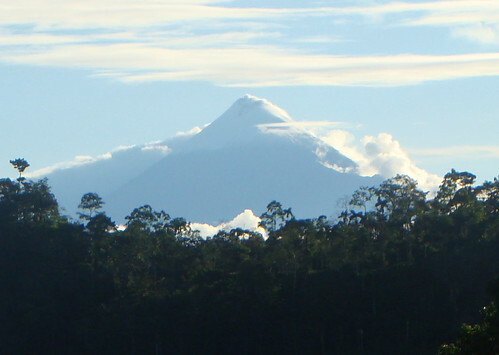 At that point the real Pan-Am via Cayambe becomes a delight (and just past Cayambe is a fantastic equator marker). Per the advice of a tourist official, we followed it to Cusubamba, where there is a turn to the left toward El Quinche. That road was OK but got busier and busier. 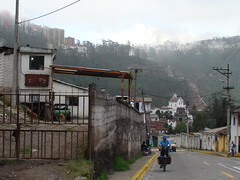 It finally dumps into the main road into Quito from the East. The idea was to get into town fast. It didn't work out perfectly. The road got quite busy. 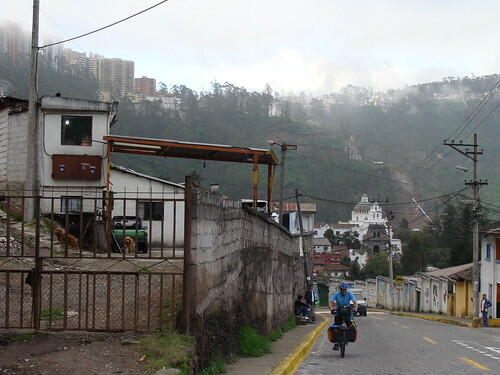 Nancy found an important alternate route: Passing into Cumbayá, ask for the back road up to Guápulo, which is a vertical road climbing right up the cliff that lands right in the main part of the new city in Quito. (Our friend who just stayed on the busy highway into the city from the east ended up hitting a couple of nasty tunnels, one of which had a policeman who turned him back when he was partway through.) It was quite a climb, but the traffic was respectful and slow. All that said, there has to be a better way into Quito. Maybe the bus. Quito is a huge and long north-south oriented city, so coming in from the north means endless metro riding. Who knows. Our guidebook suggests that a northern route would be via the Mitad del Mundo, and that there is an old road from Mitad del Mundo to Otavalo. Sounds good to me. A friend also highly recommended the back road from Otavalo to Cayambe. We didn't take it because it was a gloomy rainy day and we didn't want to deal with a dirt road. Leaving Quito to the south was also irritating. It was 20km from the New City out to where the highway starts. It worked out OK.
Nancy got irritated with the Pan-Am, so we detoured east to Baños (very nice), and then continued on the marked bike path down to Puyo. It was delightful. We then continued an Oriente loop to Macas. Just 30km of this was unpaved, to the Pastaza River. It was pretty ugly at first, but it got better. All but this 30km was delightful pavement. From Macas we continued to Mendez, which again was mostly paved, but there was 20km of poor-ish dirt road. Then we ascended up to Paute, which was an awesome ride. About 25km of this was unpaved. An amazing amount of elevation gain. And incredibly beautiful sights. This Oriente detour is highly recommended and could be combined with a jungle expedition pretty easily. It was a bit remote than what we've usually done, so we ended up camping a couple of times, and once we needed more food than the pitiful amount we normally carry. Cuenca to Loja was pleasant, but the best part was about 20km past Saraguro (a nice town) at San Lucas. There at the bridge we took a left turn to go down the river on the Old Pan-Am, which was a delightful dirt road. No traffic, (but dogs of course), and just a great way to go. And shorter and easier than the new Pan-Am. 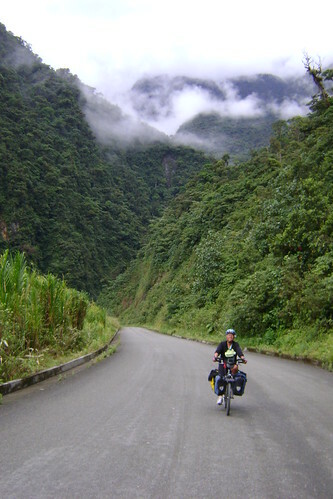 Most bike tourists follow the Pan-Am from Loja to Macara and to the coast of Peru, then down through Trujillo and then up into the Cordillera Blanca. But more are now continuing on in the sierra through Vilcabamba and Zumba. That's what we decided to do, and it was great (and quite rough). About 20km past Vilcabamba it becomes dirt (to all the way past San Ignacio in Peru) and starts to climb over valley after valley. The first day out of Vilcabamba we enjoyed it too much and lost track of the time and got stuck camping in a good rain at 2600 meters. Not a good night, but it was a beautiful place. From Zumba to the border were two steep hills that took us most of the day. It was an easy little 7km downhill to Namballe, the first real town in Peru, and we actually made it before dark. The route from Vilcabamba south to Zumba, into Peru, to San Ignacio, Bella Vista, Chachapoyas, Kuelap, Celendin, and to Cajamarca has turned out to be one of the most delightful stretches of the whole trip. Highly recommended. Mostly dirt road, some muddy, some hard (not too hard in Peru - the grades have been easier than in Ecuador). But all wonderful. A great way to enter Peru.